September can be a great time to start something new, why not teach your toddler Spanish. The idea might sound a bit crazy when you think that they are only starting to speak their first language, but this is exactly why it is the optimal time to introduce a second language, at their developmental stage, they are the best students, very easily entertained, posses the most inquisitive minds and are ready to copy and imitate sounds. The key to success is putting yourself in their shoes, think what your toddler or toddlers love to do and do it in Spanish. Read here some tips on how to start. For Spanish classes for toddlers and pre school children in Wandsworth, Earlsfield, Clapham, Balham and Wimbledon check our groups here. The beginning of a new year is the perfect moment to plan and start new things. Why not learn Spanish with you children! For tips on how to get started read our new blog post! 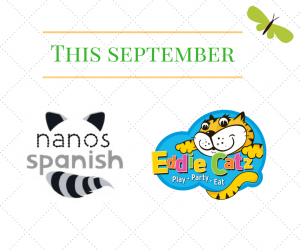 Learn Spanish with your toddler at Eddie Catz Earlsfield from September. Our classes are active, varied and fun. We aim to introduce a second language through games, action songs and educational activities. Parents and toddlers can start together the magical journey of learning a new language. When you join us this September at Eddie Catz, you will be able to enjoy their facilities before or after the class. We are offering a free trial to new Nano’s friends on Monday the 4th of September. Have a look at some of our reviews!